Q: When did you first start blogging? What's your favorite part about it? Q: What was your inspiration behind starting your shop? A: I have a lot of fun creating cute accessories for my outfits, so I thought it would be cool to offer some of these items on etsy. My personal style is pretty casual, but I like to add little pops of color with different brooches and hair accessories. Affordable prices are a big deal to me, too, and I make sure to keep my items in a reasonable price range. I ask myself how much I would be willing to pay for an accessory, and get input from my friends as well. Q: Any craft tips for beginners out there? Q: If you could see your accessories on any celebrity, who would you pick? A: I would love to see Zooey Deschanel wearing a rosette headband or brooch! She is just so cool, and I love her style. Q: Whats your: favorite candy, drink, book, and tv show? A: Candy: Twix. Favorite drink: Diet Coke (horrible I know! I have yet to kick that habit). Favorite Book: Recently, "The Lovely Bones". TV Show: Aaahh, this is hard to choose because I watch so many! Favorite TV Drama: Boardwalk Empire. Favorite TV Comedy: The League. Visit Opposite Day and come back and tell me what you love best! I love the Rosette Headband in Rose. So pretty! I really like the Fingerless Glove in Dark Chocolate Raspberry! Check out those adorable poms poms! GFC follower, thanks for the lovely giveaway. I heart the lovely Etsy shop (jcloh), thank you. I like you on FB (jc loh), thank you. I follow Wild & Precious. I love the fingerless gloves in Cocoa and Rose AND the Rosette headband in raspberry. I just couldn't choose! I love the Rosette Headband in Marigold! So pretty. first of - love the title of her shop! but then when i checked out the etsy site, i fell in love with her creations even more! i've been really into wearing my hair in a low bun with big hair clips, so obviously i'm crushing on the single rose brooch/hair clip. and red really pops in my brown hair! p.s. of COURSE i follow wild & precious! Those gloves are adorable! Love them. I love the rosette headbands in turquoise & raspberry - so cute! I am loving the fingerless grey gloves! Those would be PERFECT at school! Thanks for the cute giveaway! 1. I am following wild and precious! of course! 4. I liked Wild and Precious on Facebook from your last giveaway! what a sweet little store. my favorite is the marigold headband. favorited opp day on etsy -- how could i not? happily following steph kellys blog. I love the rosette headband in marigold! I like W&P on FB! I love the Rosette headbands in all colors, but my favorite is the rose! 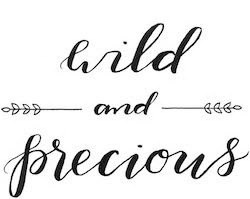 I follow Wild & Precious! 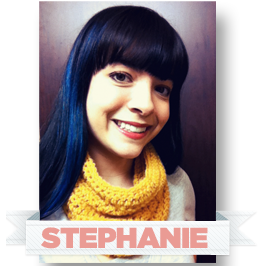 I just started following Steph's blog! 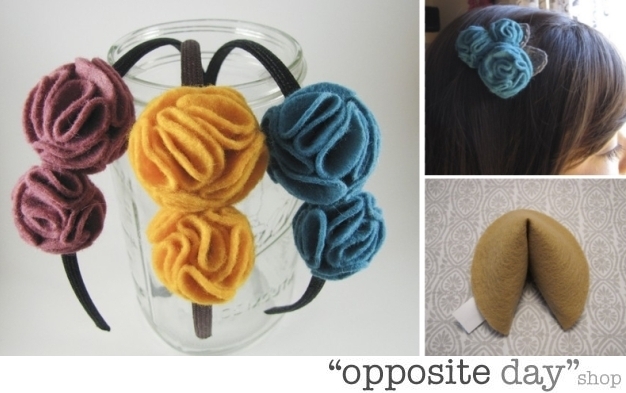 Opposite Day was just added to me favorite list on Etsy! Andddd I "like" Wild & Precious on Facebook! The rosette headband in purple is my favorite. I love the Fingerless Gloves in Raspberry best! I love the fingerless gloves in blueberry. I follow via GFC as strawberry. Love the fortune cookie greeting card! I love the single hair clip. I hearted opposite day on etsy. What I love best are the Fingerless Gloves in Dark Chocolate Raspberry. I favorited Opposite Day on Etsy. Following here with GFC as ArtsyChaos. I like Wild and Precious on facebook as Wendy R.
I love the Fingerless Gloves in Grey best! I love fingerless gloves!! Following @stephkelly on twitter as @ArtsyChaos. I'm following Steph Kelly's blog! Following @Blairita on twitter as @ArtsyChaos. I'm following stephkelly on Twitter! I love those headbands! I would wear the raspberry headband all the time! Rosette Headband in Marigold is my fav! The Rosette Headband in Marigold is my favorite. That color, gosh! So pretty. Following Steph Kelly's blog via GFC. Hearted Opposite Day on etsy. Following Steph Kelly on twitter as @ninajoleisa. Following blairita on twitter as @ninajoleisa. I love the marigold rosette hairband. I follow Wild & Precious via gfc as "sswpss"
I love the Red Plaid headband! it would look adorable on my daughter!! I love the grey fingerless gloves. I love the Rosette Headband in Marigold. I like the triple rosette brooch. I would love the Rosette Headband in Turquoise! I just love that color so much. I would happily take one of those felt flower headbands! i love Rosette Headband in Raspberry! I love the Rosette Headband in Vanilla (http://www.etsy.com/listing/46556280/rosette-headband-in-vanilla), although the Rosette trio Cluster hair clip also was very tempting. I love the Rosette Headband in Rose! I like the spring rose brooch/hair clip in shades of pink! Thanks for the chance into this giveaway. I adore the Rosette Headband in Marigold! I love the Rosette Brooch/Hair Clip in Marigold! I like Fortune Cookie Greeting Card in Chocolate. Christina - xristya@rock.com - I love the Plum Rosette Brooch/Hair Clip! I love the Rosette Headband in Purple! I follow stephkelly on twitter, @slowclublover. I like the Rosette Headband in Red Plaid. Following @stephkelly on Twitter @hle123. I loved the pink rose brooch-hair clip. Very summery.